Leave it to the Japanese to make use of every available nook and cranny to make something cuter. It’s way beyond customizing the phone cover you already have – it’s inventing new jewelry that originally served no other purpose than adding character. 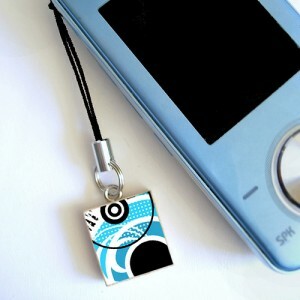 Enter: the phone charm. Then human ingenuity took off and decided, “Well, it’s pretty, but why can’t it be functional, too?” And so we end up with a charm that looks cute and attractively (or tackily) alerts us to new phone notifications – the latest and greatest in phone couture electronique. I can’t help but draw a parallel between this evolution of phone decoration and the extension of our own self-image. Phones were originally tools of convenience, but they evolved to become the center of our sense of connection. They became, if you’ll excuse the metaphor, another face to represent us in society. Through this evolving jewelry, we celebrate both the chance to extend to that face our own personalities and to give that face its own unique personality. 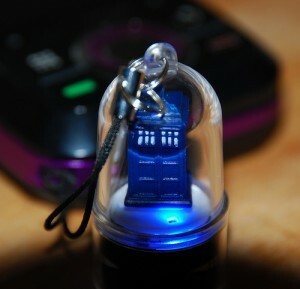 Oh, and yes, geeks – that’s a light-up, spinning Tardis. You can have one, too. What are your thoughts on the decorations we give our gadgets? Is there anything you’re waiting to see? Comment and share to keep the discussion going. And subscribe to Idyll Ramblings via email or RSS if you like what you see!